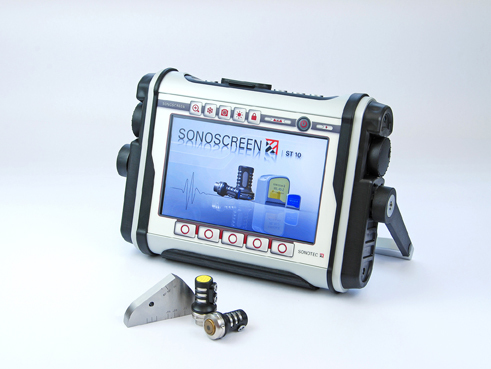 The SONOSCREEN ST10 can be used for all conventional ultrasonic tests such as weld inspections, wall thickness measurements and the detection of discontinuities, which includes invisible cracks, inclusions, voids and other discontinuities in metals, plastics, ceramics and composites. A clear menu structure guides the tester quickly through all necessary pre-test settings. All menu items are displayed in plain English and an overview of all probe settings contributes to increase the efficiency. Designed for rough applications, the ultrasonic flaw detector stands firm to extreme temperatures between -20 to 60 °C, with the large, high-resolution 8″ graphic display showing all measurement results at a glance. Menu languages English, German, Polish, Russian, Czech (others upon request).